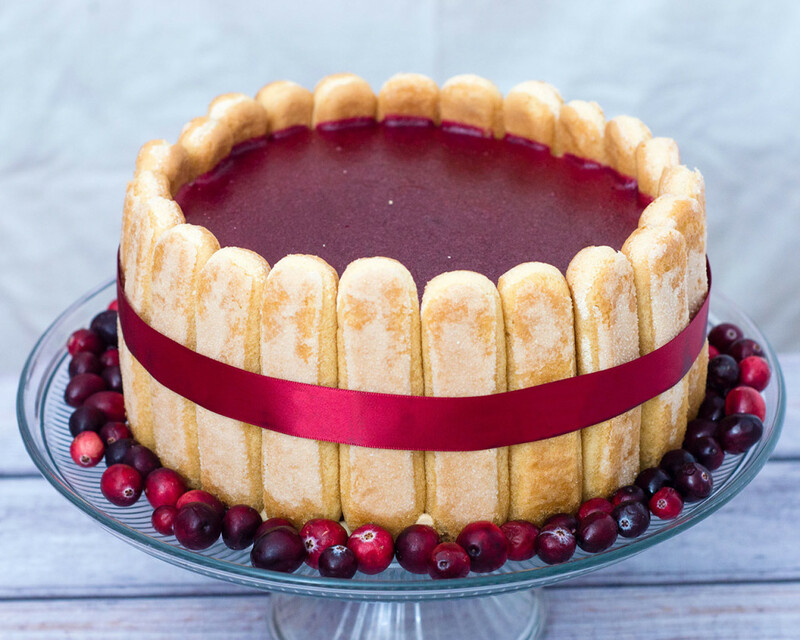 This make-ahead, no-bake cranberry apple charlotte cake will wow your holiday guests with its apple and cranberry flavors, and beautiful presentation. My favorite time of the year is getting started! I love Halloween, and I love love love Christmas, but Thanksgiving is MY holiday. I alternate hosting my family and my fiance’s family. I love choosing recipes to try, and shopping for table decor. 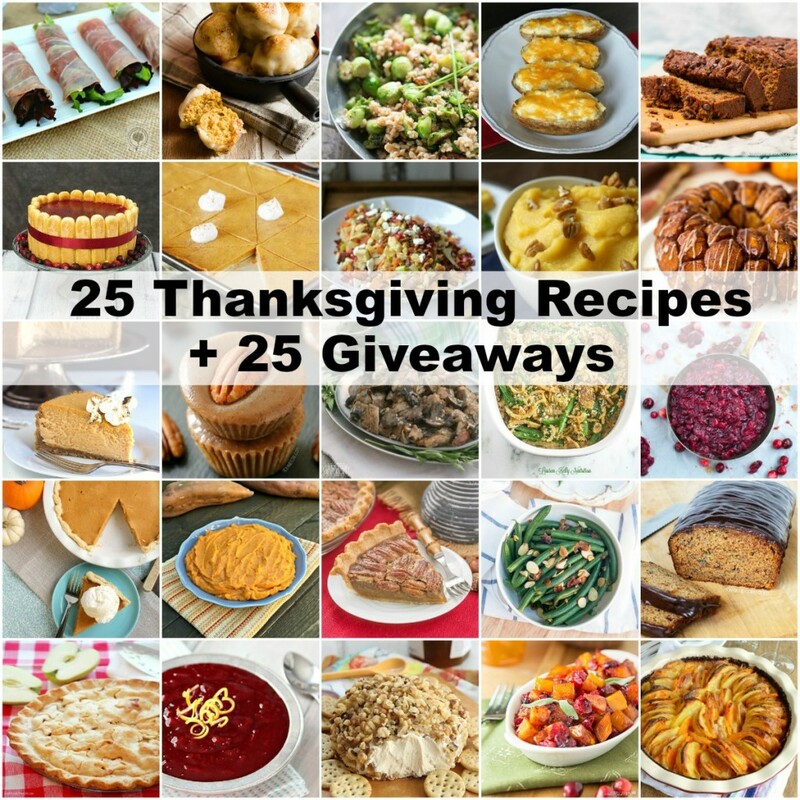 This year, 25 fellow bloggers and I got together to bring you a huge round-up of Thanksgiving recipes, and EACH of us is hosting a giveaway — that’s 25 potential prizes you could win, each valued at $50 or more. I’m offering a bundle of my favorite OXO kitchen tools. See giveaway details below. I made a Thanksgiving dessert — a charlotte cake. Charlottes have been around since the 18th century, and were very popular in the early 20th century. Though these cakes require no baking, they do take a bit of time to assemble. 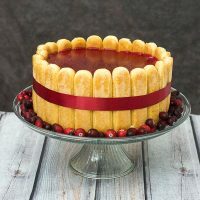 They do need to be made at least a day ahead of when you plan to serve, to give the gelatin time to set, so that works to your advantage if you want to make one for Thanksgiving. The technique involved is not difficult. If you’ve made a homemade ice cream base, you can make the cream filling needed for this cake. The hardest part is probably lining the vertical ladyfingers around the outer edge of the cake pan. Or washing all the dishes when you’ve completed the cake. But I hope this won’t deter you from attempting this beautiful and delicious cake. For this cake, you definitely want to buy packaged ladyfingers. These cookies are often found in the international aisle of your grocery store, or they can be ordered online. Freshly baked ladyfingers are soft, and would fall apart once soaked in the cider/syrup mixture. I used store-bought apple butter (found with the peanut butter and preserves in your grocery store), but homemade can be used as well. Applesauce just isn’t concentrated enough, and the apple flavor gets lost in the custard. Double-faced satin ribbon is best for using on cakes. It doesn’t absorb the moisture from cakes as easily as regular satin ribbon. Ask for it at your local craft store. Combine the sugar and water in a small saucepan. Bring to a simmer over high heat and cook until the sugar dissolves. Turn off the heat and set the syrup aside to cool. Cut a sheet of parchment paper into a 13-inch by 30-inch rectangle. Fold it in half lengthwise (so you have a 6.5-inch by 30-inch rectangle), and place it folded side down, so it lines the side of the springform pan (see left-side photo below recipe). Combine 1/2 cup plus 2 tbsp of the simple syrup with the apple cider or apple brandy. Give each ladyfinger a quick dunk on each side in the mixture (no more than 2 seconds per side), gently shake off any excess, and place in the bottom of the springform pan, sugar-side up. Repeat with the remaining ladyfingers to create a tightly-packed bottom layer (breaking cookies if necessary to fit into crevices). Leave a 1/4-inch of space along the outer edge for the ladyfingers that will form the outer edge. Continue dipping ladyfingers, and line them sugar-side-out vertically along the parchment collar. Try not to leave any space between the cookies, so no apple cream seeps out while the cake is chilling. Combine the milk, sugar, vanilla beans and seeds, and salt in a large saucepan. Bring to a simmer over high heat, stirring until the sugar dissolves (about 7 to 8 minutes). While the milk mixture is heating, pour the apple cider or apple brandy into a small bowl. Sprinkle the gelatin over top, and give a quick stir so that all of the granules get moistened. Set aside. In a medium heatproof mixing bowl, whisk the egg yolks vigorously for about a minute. Set aside. Set a fine-mesh sieve over a large heatproof mixing bowl. Set aside. Remove the milk mixture from the heat and place it next to the bowl with the yolks. While whisking the yolks, very slowly drizzle about 1 cup of the hot milk mixture into the yolks. This will heat the yolks without cooking them. Pour the milk/yolk mixture back into the saucepan with the rest of the milk, and return the saucepan to the heat. Switch a wooden spoon. Cook the mixture over low heat, stirring constantly, for about 3 to 5 minutes, until the mixture thickens. 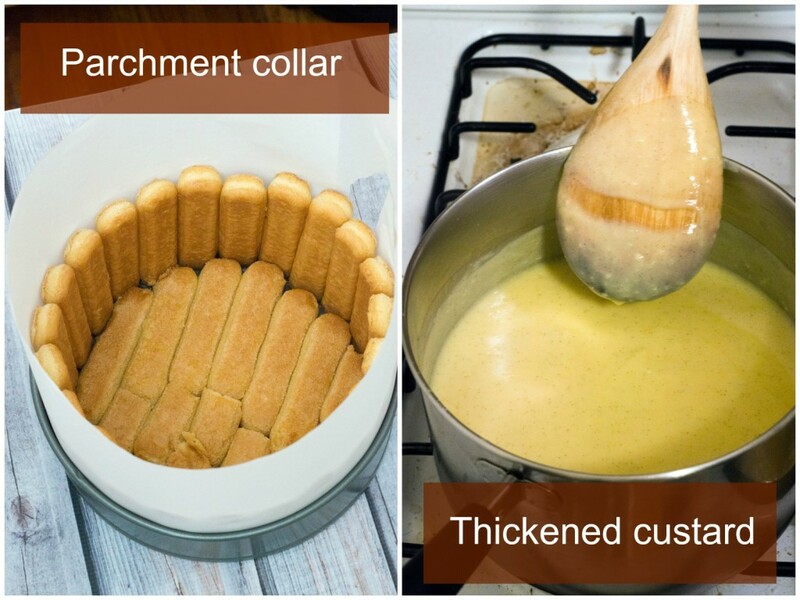 The custard should coat the back of the wooden spoon, and shouldn't run if you swipe your finger through the coating (see right-hand photo below recipe). Pour the mixture through the fine-mesh sieve into the large mixing bowl. Discard any solids in the sieve (do not press them through the sieve). Scrape the set gelatin into the custard, and stir until the gelatin fully dissolves, about 2 minutes. Set the bowl aside. Fill a wide bowl about 1/3 of the way with ice water. Place the mixing bowl with the custard in it in the ice water. Set aside for about 15 minutes. Once the custard has cooled to room temperature, remove it from the ice bath. Add the apple butter to the custard and whisk until combined. Whip the chilled heavy cream until it reaches medium peaks -- the cream should form peaks, but the tips will fall over when the beater is raised. Add about 1/2 cup of the cream to the custard and whisk to combine. Add the remaining whipped cream to the custard and use a spatula to fold the cream into the custard until no streaks remain. Lightly brush the remaining simple syrup over the exposed sides of the ladyfingers. Scrape the custard into the prepared pan and smooth the top with a spatula. Chill the cake in the refrigerator, uncovered, for at least 4 hours. Do not complete this step until the cake has chilled for at least four hours. This glaze cannot be prepared ahead of time. Set a fine-mesh sieve over a small bowl and set side. Combine the cranberries, sugar and 3 tbsp of the water in a small saucepan. Set over medium-high heat and bring to a boil. Reduce the heat to medium-low, and let the mixture simmer (you will hear the cranberries pop), stirring occasionally, until the berries are soft and begin to break down, and the liquid is thick (about 10 minutes). Remove the pan from the heat. Place the remaining 2 tsp of water in a small bowl. Sprinkle the gelatin over top, give a quick stir to make sure are granules are moistened. Set aside. Pour the cranberries mixture through the strainer. Press down on the solids with a spatula. Scrape the underside with the spatula to make sure all the liquid drops into the mixing bowl. Discard the solids in the sieve. Whisk the gelatin into the hot cranberry liquid. Set aside to cool to room temperature for about 15 minutes. Do not chill the mixture (that will set the gelatin, and make it unpourable). Pour the glaze over the cake filling, tilting the pan to ensure the glaze covers the whole surface. Refrigerate the cake overnight. Unlock the side of the springform pan, and carefully remove the parchment collar. Tie a 1-inch wide red ribbon around the cake. 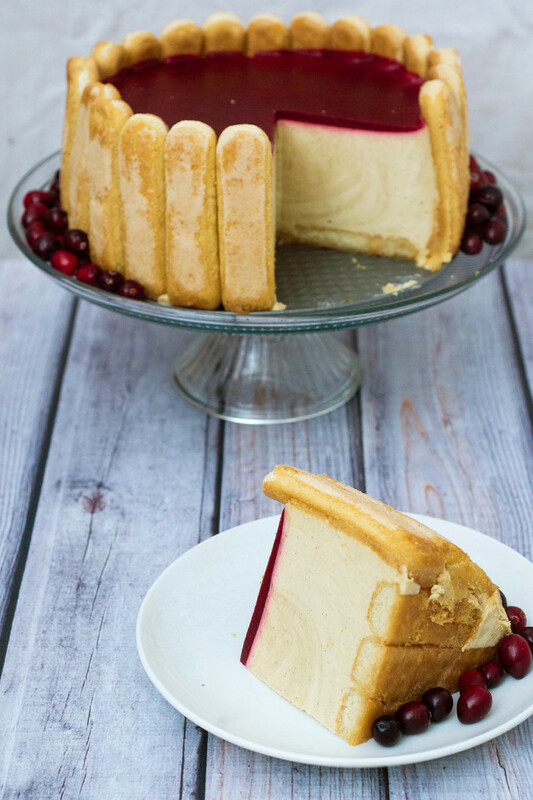 The cake can be displayed at room temperature for about 30 to 45 minutes before it will need to be rechilled. sweet potatoes and pumpkin pie! The mashed potatoes and gravy are my favorite! I always go straight for the mashed potatoes and stuffing! My favorite Thanksgiving dish would either be mashed potatoes or pie! I LOVE stuffing!!!! And your cake is absolutely gorgeous! We love alton brown’s green bean casserole. I love this cake- definitely on my to-do list. Gluten free strawberry rhubarb pie and turkey shaped sugar cookies! Thank you for the chance to win! Your dessert is so beautiful, and looks delicious. I really really love stuffing! I love to make pumpkin cake with cream cheese frosting! I love sweet potato casserole!! Homemade stuffing is my fav dish. I just love turkey with gravy on it! I love eating cranberry sauce with everything and I love the pickled beets! I love chicken and cornbread dressing. I’m a sucker for pumpkin pie! I love mashed potatoes and gravy and also the dressing! Stuffing is my favorite Thanksgiving food! I’m allllll about the stuffing at Thanksgiving! I absolutely love sweet potatoes! I love pumpkin sage biscuits! I love sourdough bread stuffing. My favorite dish for Thanksgiving is my mom’s recipe for sweet potatoes. This looks delish, but my favorite is still new york style pumpkin cheesecake. My favorite is my husband’s herb stuffing. My favorite is sweet potato casserole. I love sweet potato casserole with a pecan streusel topping. Creamed pearl onions, so much work, but so good! I love roasted root vegetables, especially rutabaga. 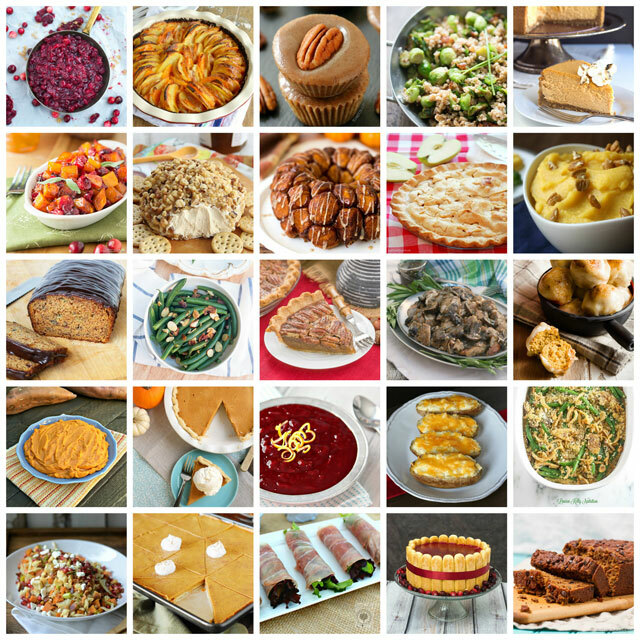 Love the stuffing, cranberries and pumpkin cheesecake! This is so awesome and that looks delicious! My favorite dish is definitely stuffing! The dressing is my favorite. 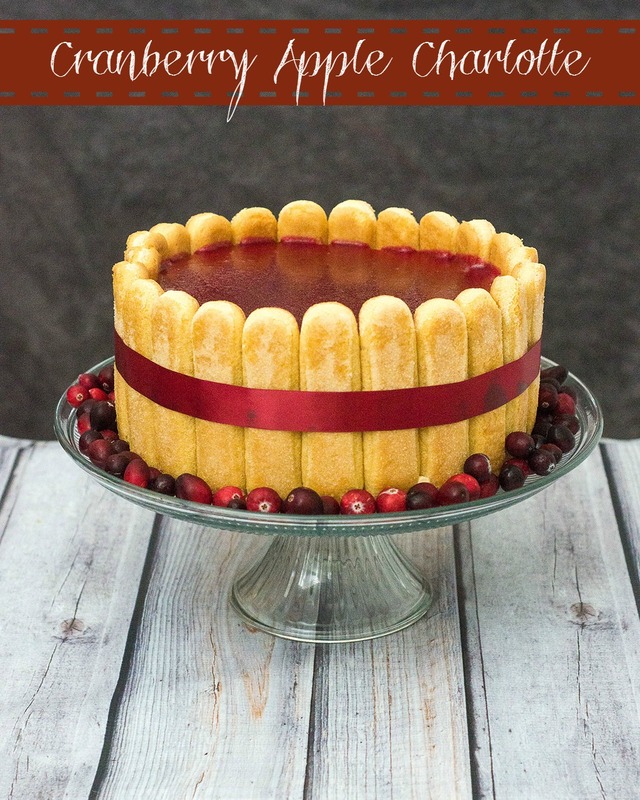 My favorite dish is cranberry sauce…and that dish looks divine.